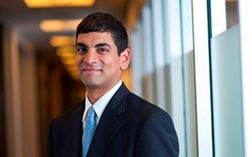 Vasu Addanki is a director with Betts Patterson Mines where he represents insurers in first- and third-party coverage and bad faith matters. His experience includes counseling clients on such issues as triggers of coverage, contribution and allocation, contractual risk-shifting, and tenders of defense as well as defending insurers against claims of statutory and regulatory bad faith and violation of the Consumer Protection Act. In addition to representing insurers, Mr. Addanki represents non-profit corporations and their directors and officers in breach of contract, breach of fiduciary duty, discrimination, and business tort matters. Mr. Addanki also has experience handling complex litigation, commercial litigation, and product liability matters. Prior to joining Betts Patterson, Mr. Addanki practiced in Chicago with a boutique litigation firm as well as with a large, multi-service firm. Mr. Addanki was also an Assistant Defender with the Defender Association of Philadelphia where he successfully tried numerous felony cases to verdict. Represented an insurer and its agent in a negligence, negligent misrepresentation, and Consumer Protection Act lawsuit brought by the insured, a former NFL player. The insured alleged that the agent underinsured the value of his contents in his home, including his collection of NCAA and NFL memorabilia, which included original artwork as well as trophies awarded to the insured during his playing career. The parties settled in an amount favorable to the insurer and its agent after the defendants filed a Motion for Summary Judgment. Represented a property insurer in a bad faith and Consumer Protection Act action brought by its insureds. The insureds alleged that the insurer failed to pay for all resulting damage from a lightning strike event and failed to perform an adequate investigation. The court granted summary judgment in favor of the insurer and ruled that the insurer paid what was owed and investigated the claim thoroughly. The court also ruled that the insureds failed to provide the court with any evidence to create a triable issue of fact. All claims were dismissed. Represented a liability insurer in a coverage and bad faith lawsuit. The insured, a 35 year-old woman, was accused of a three-year manipulative sexual relationship with a minor boy. When the boy and the parents sued, she tendered the case to our client, which denied the tender. We defended on the ground that the accusations were not allegations of an accident, which is critical for attachment of liability insurance coverage. The U.S. District Court, and the Ninth Circuit Court of Appeals agreed, and our client was vindicated. Schorno v. State Farm, Slip Copy, 2011 WL 3325873 (9th Cir. 2011). Defended a homeowners association and its board of directors in a lawsuit filed by two homeowners against their upstairs neighbors and the association for breach of contract, breach of fiduciary duty, and discrimination. Plaintiffs' lawsuit arose out of a substantial remodeling project undertaken by their upstairs neighbors. Plaintiffs alleged that the remodeling project caused damage to their unit and violated the association's governing document as well as City and Building Codes. Plaintiffs alleged that the association breached the Declaration by approving the project, breached its fiduciary duty by failing to manage the project and mitigate its impact upon plaintiffs, and discriminated against plaintiffs by allowing the project to go forward. The association prevailed after a bench trial that spanned three weeks. The Court found that the association acted reasonably in approving and managing the remodeling project, and ruled against plaintiffs on all of their claims. Represented a professional liability insurer in a declaratory judgment action against its insured and another professional liability insurer. Our clients' insured, a prominent Chicagolaw firm, was sued by its former client after a complex dissolution agreement that the law firm prepared was found to be defective, preventing the claimant from recovering millions of dollars. The insured tendered the suit to our client as well as to the other insurer, which provided coverage for the immediately preceding policy period. The other insurer sought contribution from our client for millions of dollars of defense costs and indemnity. Our client prevailed on appeal in the Seventh Circuit. Justice Posner found that our client did not have a duty to defend the insured law firm because various policy exclusions applied to bar coverage. James River Ins. Co. v. Kemper Cas. Ins. Co., 585 F.3d 382 (7th Cir. 2009). Co-Author, Washington Chapter, 2016 DRI Unfair Claims Settlement Practices Compendium. Author, Washington Chapter, 2016 DRI Rescission Compendium.